Marjorie Ahrendsen, 87, of Olin, Iowa, passed away Saturday, July 6th at Mercy Hospital, Cedar Rapids of complications of surgery. Visitation was July 9 from 4 to 7 PM at Lahey Funeral Home, Olin. Services were Wednesday, July 10 at 11:00 AM at the Lahey Funeral Home, Olin. Burial followed at the Olin Cemetery. Marjorie was born June 26, 1926 near Olin to Carl Schellin and Esther (Knight) Schellin. She attended Olin Consolidated Schools, meeting the "love of her life" Norman when he joined the class in 7th grade from country school. They were married on December 27, 1943. They farmed near Olin most of their lives, raising a daughter, Sheryl Knodle, and two sons, Dennis and James. Farming and family were her joy. Every spring she looked forward to the new spring calves, making trips to the field with her husband to check on them. Watching the Atlanta Braves Baseball team on TV was another favorite which she avidly followed. In earlier years she liked to dance and work on jigsaw puzzles. She loved to cook, and mow and care for her yard. 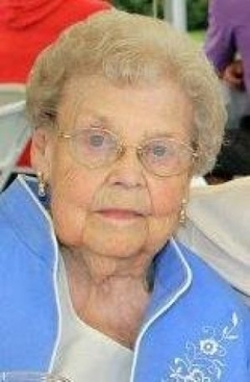 She was also a Gold Star Mother, and member of the Olin Community United Methodist Church in Olin. Surviving are her husband of 69 years, Norman of Anamosa Care Center; daughter Sheryl (John) Knodle of Marion; son James (Dawn) Ahrendsen of Anamosa; six grandchildren: Tim, Todd, Tracy, and Terry Wood, Kyle Ahrendsen, and London Sadler; six great-grandchildren; two brothers-in-law, Lowell and Gayle; three sisters-in-law, Jeanne, Wanda and Pauline; a special friend Angie Harms of Olin; numerous cousins, nephews and nieces. She was preceded in death by her beloved son Dennis in 1968, serving his country in Vietnam; parents and parents-in-law to whom she was particularly close; five siblings and several nieces and nephews.